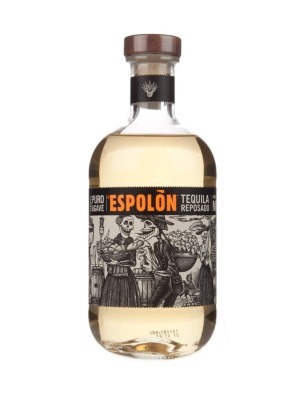 Espolon Reposado is a popular Tequlia available from TheDrinkShop in 70cl to buy online. Visit TheDrinkShop for the best price for 70cl of Espolon Reposado or compare prices on our other Tequlia products. Appearance: Rich, golden hue. Nose: Spicy, caramel aromas with a hint of chocolate. Taste: Bold, round mouth feel leads to a medium-dry fullbodied palate with rich roasted agave, sweet tropical fruit, intense vanilla and brown spices. Finishess lowly with a sweet spicy fade. A hedonistic Reposado that has Anjeo-like wood spiciness. Espolon Tequila is crafted at the acclaimed San Nicolas distillery. This state-of-the-art facility, located in the Los Altos Highlandsregion of Jalisco, is recognised as the best factory in Mexico. Master Distiller Cirilo Oropezahas a passion for perfection and brings decades of experienceto Espolon. Craftsmanship is favoured over mass production, creating a super-premium, multi award-winningproduct. To extract richer, more intense flavours, Espolon pinas are cooked for 18-20 hours(versus the industry avarege of 12) and the distilling process last 5 and a half hours(versus the industry average of 3 and a half hours). Where to buy Espolon Reposado ? Espolon Reposado Supermarkets & Stockists. You can buy Espolon Reposado online in most retailers and find it in the Tequlia aisle in supermarkets but we found the best deals online for Espolon Reposado in TheDrinkShop, DrinkSupermarket.com, and others. Compare the current price of Espolon Reposado in 70cl size in the table of offers below. Simply click on the button to order Espolon Reposado online now.